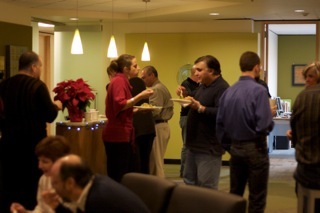 Invitations were sent out weeks ago to thinkspace members for this year’s Holiday Party, and while a few people couldn’t make it due to previous commitments and the general holiday bustle, we ended up having a ton of members show up to join in on the fun! The only stipulation we made for those wishing to attend was that they bring in at least one non-perishable food item to donate to Northwest Harvest. NW Harvest’s mission is to provide nutritious food to hungry people statewide in a manner that respects their dignity, while fighting to eliminate hunger. thinkspace members went above and beyond and brought in quite a bit of food to donate to this noble cause. Thanks so much to all who participated! Just thinking about the food is making my stomach rumble! Baked rigatoni, foccacia bread and ceasar salad were served as the meal with vegetarian options available as well. The food was delicious and catered in by, well, The Catering Company of course (yes, this is really their name). The Catering Company is a local business, based out of Redmond with some great tasting food, for breakfast, lunch or dinner. thinkspace actually holds an account with them, so if anythinkspace members would like to order from The Catering Company while in the space, we are able to take care of the hassle for you. Check in with the frontdesk for more information on this and other catering options. Our party didn’t quite end there. 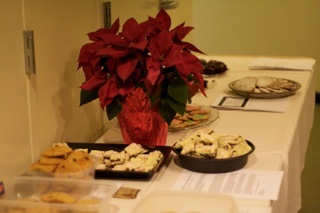 We also had a Cookie and Recipe Exchange among members. From pistachio bread to peppermint bark to traditional sugar cookies; we had a great variety of sweet treats for party guests to sample. Each participant also brought in copies of their recipes so that others could attempt to replicate their favorite decadent desserts for their own friends and family. 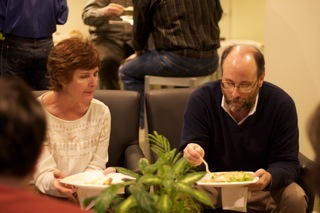 All in all, it was a great Holiday Party; the perfect way to see out a great year!